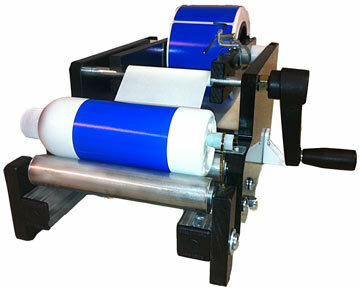 Our semi-automatic hand-held bottle capping machines tighten screw caps from 18 MM to 50 MM in diameter. Our machines are easy to set up, easy to use and provide good torque accuracy. Our capping systems were designed and priced for small businesses. They are everything a small business needs in a capping system, at less than a quarter of the cost of other systems. Our semi-automatic bottle capping systems take the drudgery out of screwing on caps. They allow you to cap up to 1500 bottles per hour, to a pre-set torque, speeding production and lessening the risk of blisters and repetitive motion injuries. The Quick Capper QC100 system includes a professional quality lever operated electric assembly torque driver unit. The torque is easily adjusted from 2 to 17 inch-lbs, by an external torque dial. It operates on standard 110 VAC, or 240 VAC power with a Speed Controlling DC Power Supply which eliminates the need for an air compressor. The capper features an adjustable slip-clutch torque limiter. Just set the desired torque, place the driver firmly on the cap, and press the lever. When the desired torque is reached, the slip clutch engages, telling you to go on to the next bottle. Our system includes a 36 inch Tool stand, with a 12-inch arm. 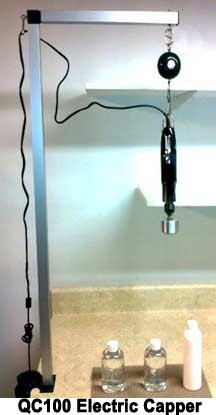 The stand can either be permanently attached to your bench top with screws, or temporarily attached with two c-clamps, and can be configured for either right hand or left hand operation. Our included tool balancer/ positioner features adjustable tension, supports the driver, keeps your power cord out of your workspace, and ratchets to hold the Driver in the desired position. An anti rotation mat helps to hold your bottle in place while you cap it. Capper Driver Shells and Inserts - Our capper head consists of a driver shell which attaches to the driver with a 1/2"-20 threaded arbor. The shell accepts replaceable rubber inserts which engage the cap by friction. The inserts last from several thousand to a few hundred thousand caps, depending on the surface of the cap and the torque used to apply them. Shells must be ordered separately. Choose a shell to match the size of your caps, and add it to your order. Replacement inserts are relatively inexpensive and are available from Applied Urethane Services. A special deep shell for sprayer and dispenser caps is also available on custom order. 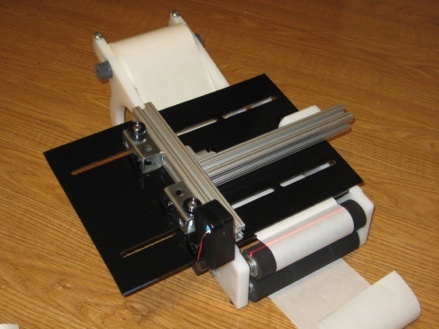 Order a Quick Capper System today. Orders usually ship within 24 hours, and Priority Mail usually gets it to you in 3 days. If you are unhappy with the Quick Capper for any reason, you can return it within 30 days for a full refund of your purchase price. We want only happy customers. After you click the button, you will be offered a choice of paying with your Credit card or by PayPal. 5. Tool Balancer and Positioner. Order Shell to match your caps below. Deep Shell for Sprayer Caps and 4 Inserts for caps from 18 MM to 28 MM - $149.00. Custom built to fit your caps. Email for details before ordering. Just wanted to let you know that the Quickcapper worked very well in our application. We had to fill and cap 5,000 bottles of product samples as a special project, and the Quickcapper was just what we needed. So much better than doing it by hand, and not so fancy/expensive as other capping machines. 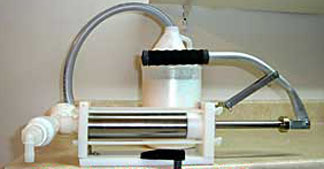 Zap Labler for only $399. per hour with lotions, creams and sauces. Handy Filler for only $399.